Theory runs thick in computer music. Come to think of it, a brisk commerce in signal is a symptom of noisy neighborhoods in general. This is understandable enough. How many other reasonably honest choices are there when confronted with an experience shortage? The whole computing machine dance up until now has been so short-- like a baby accumulating half-truths. Well, if the commonweal's experience-cupboard is bare, then fill it. Should be a perfect playground for fools. Our doing this surely must have been kicked along both by the dissatisfaction with sleepwalking and by some growing appreciation of the edge as panacea. But our simplest and least obscure motive has probably been curiosity about how musical performance works when it is done on computing machines. When the timbre space goes infinite and has a memory, how do you go about assembling a meaningful piece of time for some particular group of people at some particular place? The relative scarcity of cliche (both social and musical) in computer music creates this situation where a framework for listening somehow needs to be generated at the same time as it is filled with sound-- context and content made more or less simultaneously. There is this beautiful similarity to the historical interplay between worldly conundrums and abstract mathematics. It has been more than interesting to notice that this interplay turns out to be sampling in disguise. The ambit of all this is really the same one music has always had: to set up a situation where the air shakes in a certain way and begins to give off inevitability outside of human language. We use a couple of powerbooks, some controllers, a black box or two, an amplifier and some speakers. Loud? No, it's not all that loud. 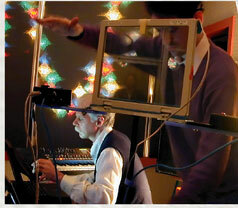 In other lives Engstrom is a film-music composer; Fleeger an sound designer. They have been knocking out theories on mass transit since the turn of the century and performing together since fall of 2001. 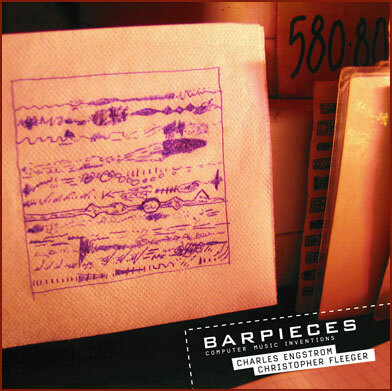 Barpieces are audio scores of twelve computer music inventions worked out by Charles Engstrom and Christopher Fleeger in live performances around North Florida from 2001 to 2004. Ideas about gathering places as social and sonic resonators group this material. More narrowly, the focus became computer music performances which could maintain some revelatory utility in the hurly-burly of ordinary public listening-- in a barroom, for instance. 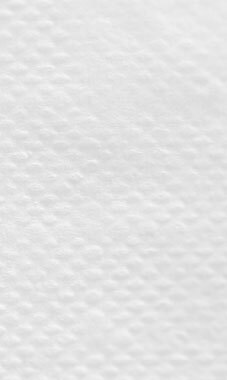 The resulting pieces are formally simple, relatively short in duration, and try to maintain distinct timbral surfaces. Methods include the gas laws, lissajous curves, set transformations and fourier harmonizations of the ambience in performance spaces. The sonics range from simple synthetic waveforms, excited glass, wood and metal to slot machines, washers and other timbral pointers to the everyday world of the early 21st century. 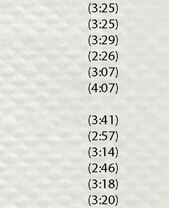 There is a short list of the philosophical residue of the process on the back cover of the disc.